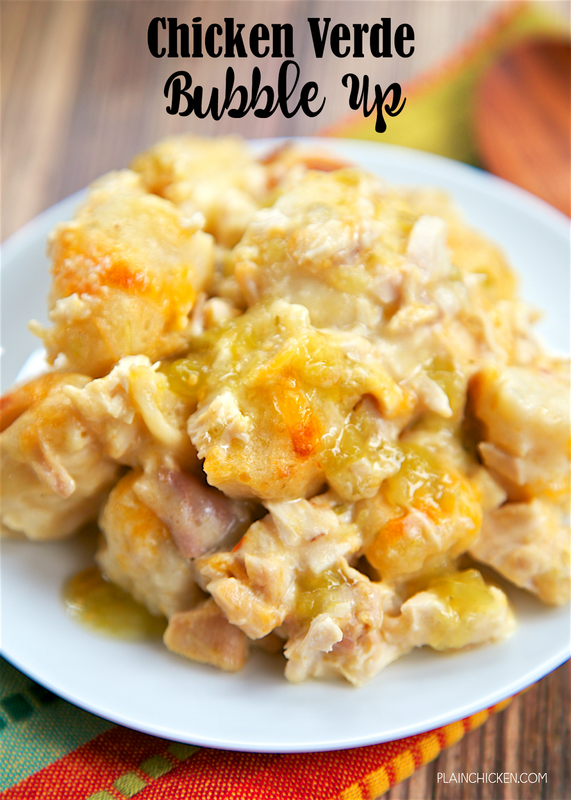 Chicken Verde Bubble Up - chicken, sour cream, milk, salsa verde, cheddar cheese and refrigerated biscuits. Ready in 30 minutes! 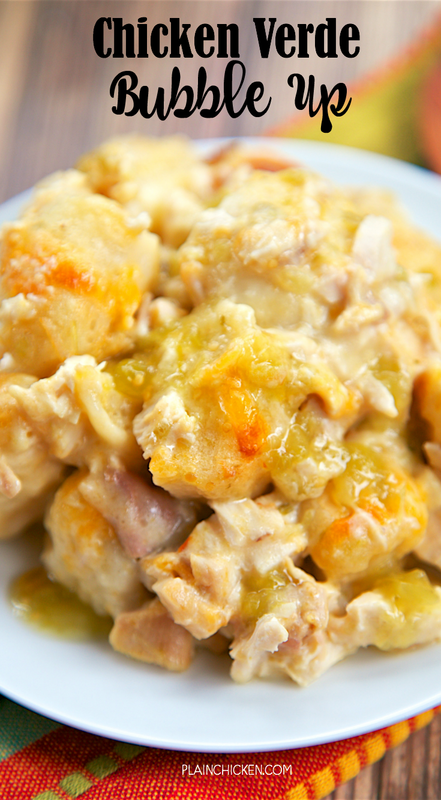 Mexican casserole with chicken, cheese and chopped biscuits tossed in a quick homemade sour cream salsa verde sauce. SOOO delicious! Everyone cleaned their plate and went back for seconds! Crazy good! This is one of the best things we've made in a long time. It might be my new favorite Bubble Up! It was so good! We both cleaned our plates and went back for seconds. Crazy good! We served this with some Southwestern Green Beans and Enchilada Rice. Such a quick and easy meal! 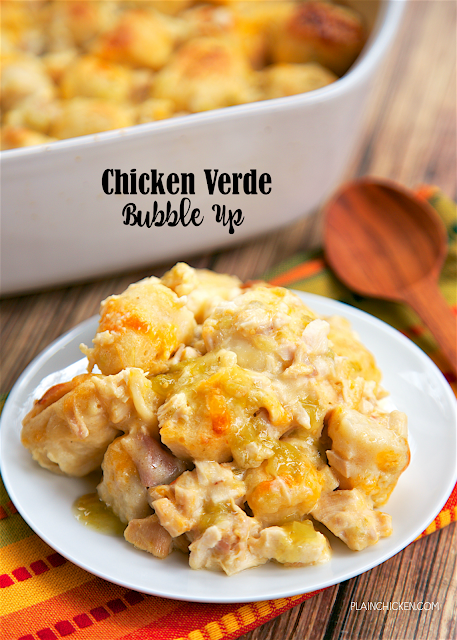 This Chicken Verde Bubble Up uses a quick homemade sour cream salsa verde sauce. It only takes a couple of minutes to make. I like to make it first and let it cool slightly while assembling the rest of the casserole. You could even make it ahead of time and refrigerate it until ready to bake the casserole. Make sure to use Pillsbury Grands Jr biscuits - not the larger Grands biscuits. The Grands are too big and won't cook through. Also, make sure to spread out the biscuit dough once you pour it in the pan. You don't want big clumps of dough in the casserole. That will prevent the dough from cooking all the way through. In a small sauce pan over medium heat, melt butter. Whisk in flour and cook 1 minute. Add broth and whisk until smooth. Allow sauce to thicken. Remove from heat and stir in sour cream and salsa verde. Set aside. 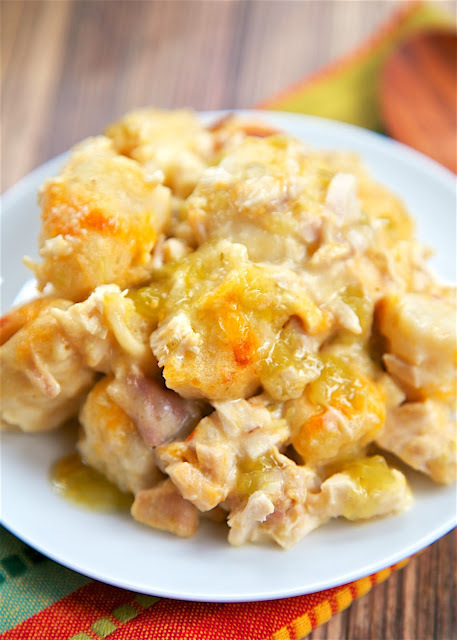 Add chicken and cheddar cheese to large bowl. Pour sour cream sauce into bowl and stir. Cut each biscuit into 4 to 6 pieces. Add to bowl and toss to coat. Pour mixture into prepared pan. Make sure to spread out biscuit dough in pan to eliminate any clumps of dough. Bake for 25-30 minutes, until bubbly and biscuits are golden brown. Serve with additional salsa verde on top if desired. 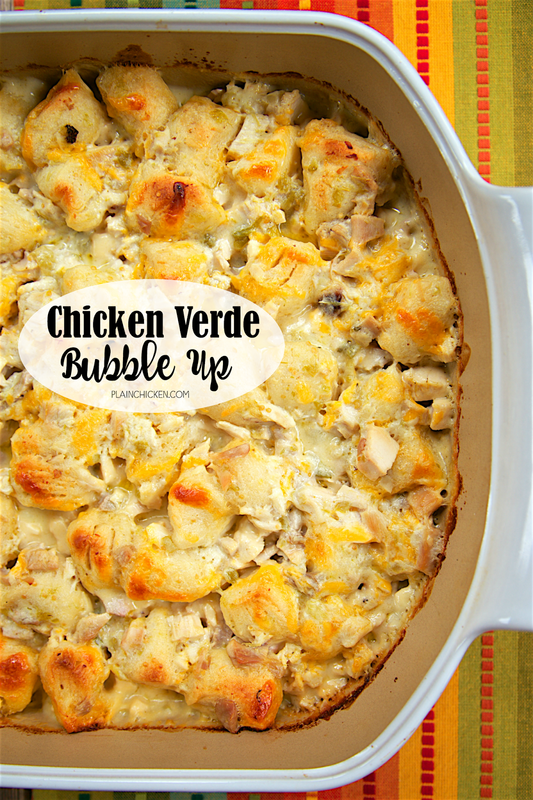 We love salsa verde...and I've never tried a bubble up casserole. Adding this to the list!! Mmmm gotta make this soon! I bet it was awesome with the rice! this was so tasty! Family loved it!